5. Jumping rear high and nose low. 6. Low ground clearance contributing to bottoming out. With these things in mind we dove straight into the spring kit. The factory springs are quite stiff. In addition to this, the cross over rings (what brings in the heavier lower spring) are set very low which means you get a stiff ride way too soon in the suspension travel. 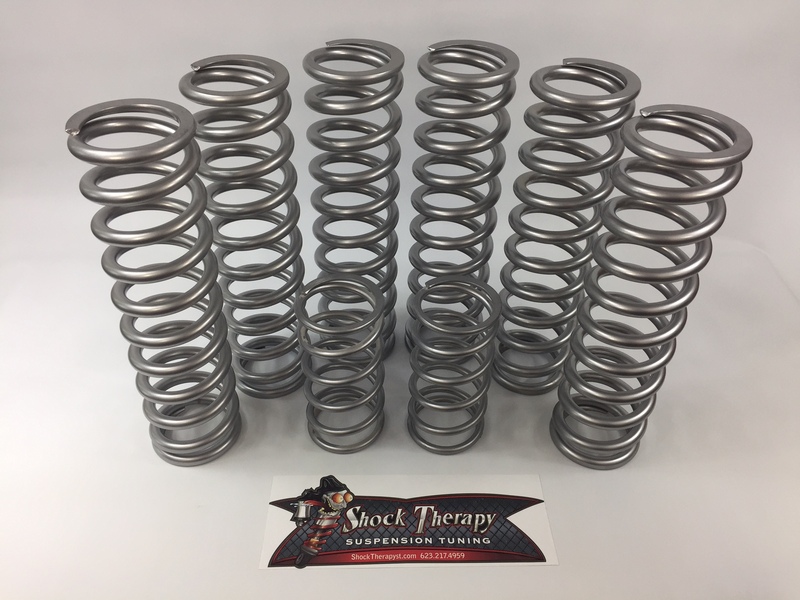 The stock rear spring package uses a triple spring system because the spring rates are so high that two main springs become loose when the suspension is drooped all the way out. If you try to remove this loose gap when drooped out then the car sits way too high. By using a much lighter and longer spring system, we are able to get rid of the triple spring and use an extremely progressive dual rate spring system that never becomes loose when drooped out and gives a much, much smoother ride where you use it the most. Small chop and chatter is vastly improved. The whoops become smoother and less harsh. Rear bucking is all but eliminated in both the whoops and when jumping. And lastly, your ride height and ground clearance will go up another 2 inches. This added height actually rides smoother and more plush than the factory system as well as giving you extra clearance for rocks and rutted trails without needing to ever use a lift kit! You can expect a much more plush ride in the small chop and whoops while at the same time gaining more bottom out resistance in the biggest hits where you need it. Our dual rate spring kit is truly the best of both worlds in ride quality improvement that you can install yourself! I couldn't be happier with the way the car rides after the installation of the spring kit. It does what Shock Therapy says it does. Installation was simple. I have about 250 miles on the trials in Minnesota and Wisconsin since installed. The ride is way more plush than stock. Thanks! Click the button below to add the Dual Rate Spring Kit (DRS) 2017-2018 Can Am X3 DS & XC 2 Seat to your wish list.